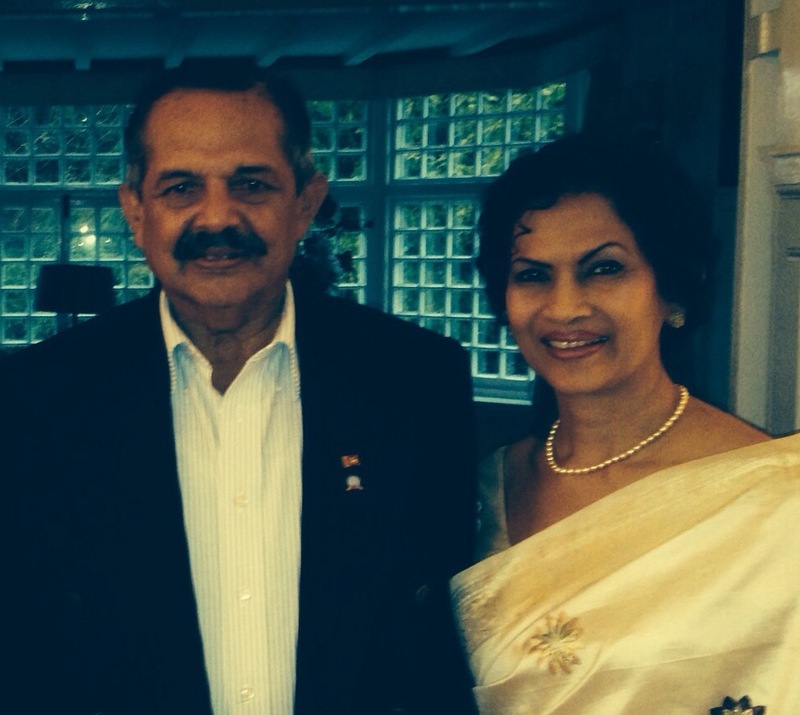 The South African Tamil Federation (SATF) has written to the organizers of the Association of Military Christian Fellowships – Global Interaction 2014 over the arrival of former Sri Lanka Army General Srilal Weerasooriya in South Africa, who has been held responsible for the genocide of over 70,000 Sri Lankan Tamils in the 90s. In a letter, the SATF Joint Secretary Marie Pillay-Ramya – representing the interests of Tamil speaking people residing in South Africa has said they believe General Weerasooriya’s presence in South Africa is ‘outrageous’ as his past conduct has been ‘unbecoming’ of a ‘born again Christian and a God fearing man’. They have pointed out that a man who should be tried and convicted for human rights violations on Sri Lankan people being present in South Africa to participate in the event organised by the Military Christian Fellowships organisation, has concerned them greatly and is a matter that has brought disdain adn disappointment to the Tamil speaking community living in the country. The SATF has gone on to state that substantive proof and testimony exists to Weerasooriya’s atrocious involvement in the genocide of between 70,000 and 100,000 Tamils in Sri Lanka and that they hope the SA government would back the ongoing international investigation against Sri Lanka on the continued oppression of the Sri Lankan Tamils. Weerasooriya was appointed the Commander of Sri Lanka Army in 1998 and was previously in command of the Jaffna peninsula throughout 1995 and 1996. His involvement in the genocide of Tamils and particularly his involvement in the Chemmani mass killings have been extensively documents by the University Teachers for Human Rights in Jaffna organisation as well as international media. Gen Weerasooriya was never involved in any of these activities he was an officer and a gentlemen like Majors Larry Wijeratne,Susantha Mendis,another Jaffna commander whoese name i cant remember who was killed when Nimal the clownish minister went to jaffna in 1996,Nalin Senevirante,Rockwood,Balaratnarajah were all decent officers. Many of the SL military men have been documented to have committed, like the LTTE, atrocious crimes against the civilians. The evidence is there but the investigations were not conducted because the Sinhala government’s did not allow them. My friend, there Is documentary evidence of this retired general’s complicity in the Chemmani massacres. The right place to deliver a guilty or innocent verdict is an impartial investigation. Period. Documented by whom? Diaspora, paid watch dogs and asylum seekers? War is war and is always dirty. What is the goal of parties involved in a war? to kill and destroy as many as possible. When fighting terrorist groups (who can’t be separated and identified from civilians), civilian deaths occur. US forces killed large number of civilians during the Iraq war. Why is there no investigation? You raised arms against the gov. to take over the country. You did not succeed but learnt a lesson so now move forward! Book review by: Bruce Haigh is a political commentator, retired diplomat, who served in Sri Lanka and former member of the refugee review tribunal. Have you noticed sach and nuisance have the same script writer? “South African Tamils Slap War Crime Charges Against Lankan General”A South African Tamil group has filed criminal charges against a visiting former Sri Lankan general for alleged war crimes during the civil war with LTTE. General Srilal Weerasooriva is in South Africa as part of an international delegation attending the Association of Military Christian Fellowships – Global Interaction 2014 at the naval base of Simonstown. The general and his wife Dilhani led a worship and evening session at the event. In a statement, South African Tamil Federation (SATF) confirmed charges were pressed against him with the Commissioner of the Special Unit for Foreign Crimes in South Africa for alleged violation of human rights during his tenure as the Commanding Officer of the Sri Lankan Army in the 1990s. “We call on the South African Government, which has always supported the struggles of the Tamil people in Sri Lanka to, under its universal jurisdiction laws, immediately arrange for the arrest and trial of General Srilal Weerasooriya, prosecuting him for the alleged crimes against humanity,” SATF, which represents almost 6,00,000 Indian-origin citizens, said. SATF got support from another group called Solidarity Group for Peace and Justice in Sri Lanka, which has strongly condemned Weerasooriya’s presence in South Africa. Both organisations made it clear that they acknowledged the fellowship conference as a project for the betterment of the people of South Africa, but said Weerasooriya’s presence would tarnish that image. “With the tight immigration restrictions and visa controls (in South Africa), we are surprised at the ease of allowing a war criminal into the country,” the statement said. They also demanded from the Association of Military Christian Fellowship to unreservedly apologise to South Africans for their lack of foresight in investigating the retired General and for inviting him to the country. The Association could not be reached despite repeated calls. According to the United Nations, 30,000 people were killed towards the end of the ethnic conflict in 2009 when the Liberation Tigers of Tamil Eelam (LTTE) was finally crushed. Are you quoting Trevor Grant (a sports reporter!) as the witness of genocide or spokesperson for Tamil diaspora terrorist groups? GENERAL WEERASOORIYA WAS ACCUSED OF KILLING OVER 75,000 INNOCENT TAMILS AND NOW HE BECAME A BORN IN CRISTIAN AND HIS SINS FORGIVEN AND HEAVEN DOORS BEEN OPENED TO A BUTCHER. @T. George, I am sorry to disagree with you politely. Gen. W did not kill innocent Tamil people but military goons under Janaka Perera committed all these crimes against humanity at the time of Chemani, but the dirty fellow was given the same treatment what he rendered to others. I have met Tamil people who personally know of Gen. W and they all speak quite nicely of him. You have seen my comments on CT and I am very critical of all racists. But we cannot accuse this man without proof. That itself is a sin to do that. There were some LTTE members who were against killing innocent Sinhalese civilians as well. They were wiped out by wonderful VP. We do not know why all of a sudden we hear this about Gen. W but not the real butchers like the following: Kamal Gunaratne, Shavendra Silva, Jagath Dias, Chagi Gallage, Jagath Jayasuriya, Sarath Fonseka, Mahinda Hathurusinghe, Prassana Silva, G.A. Chandrasiri, G.V. Ravipriya, Nandana Udawatta, Mendaka Samarasinghe, Satyapriya Liyanage & Nishantha Wanniarachchi are allowed to roam the streets with full impunity. born again to be like Bush the Shrub who is sulking and unable to visit Geneva for fear of being arrested. @Javi, merely because someone is born again does not mean that person has really changed in a spiritual manner. Don’t mix faith in Jesus and racial politics. Lot of people I have come across on this planet, who practically live in a church are some of the most vile people I have ever come across. Did they really practice what they believe in is the question you need to ask? Also in order for us to question them, do we practice what we preach? Most of us don’t do what we preach. This man Gen. W was completely out of the picture all these years and suddenly just before the elections his name comes up. But all the butchers who butchered innocents, are given diplomatic positions and sent off to far away lands with full diplomatic immunity, don’t you wonder why? I am wondering why!!! We need to correct what is happening now and what is to happen in the future. So, everyone should put a concerted effort in getting rid of this hoodlum MaRa and his family from SL and throw them in Bogambara prison to languish in there rest of their lives. No point in burning the whip when you allow the whip holder to live. He will find another whip to hit people. Let us get rid of Mara, Goat, Basil, Chamal and the entire MaRa clan. Your writings make all Tamils liars and not taken seriously. I thought you did and you found ZERO bodies. Where was Gen. Weerassoriya when the Chemani Massacre took place? @T. George, I concede defeat in this argument. I believe he was commander of the forces in Jaffna around 1996 (with further research), around the same time when this massacre took place. I believe Janaka Perera was there having command around the same time as Weerasooriya. I believe these two Generals, commanded Jaffna together. But my disagreement with you was purely based on what I have heard from people who have come from Jaffna around that time to Canada. I have also spoken to an army officer who compared him to Gen. Kobekkaduwe as a gentleman officer. So, I thought I should not throw any accusation on this man without any evidence. GEN. WEERASOORIYAS SINS FORGIVEN NOW HE IS A BORN AGAIN CRISTIAN BUT GEN. WEERASOORIYA KNOWS THE REAL BUTCHER WHO DID THIS DIRTY WORK AT CHEMANI. @T. George, I think it was Janaka Perera. Is my thinking correct? What is your opinion. If I am correct, he got what he deserved in Anuradhapura. I heard it was 75 million innocent Tamils. Hey Taraki, I guess you were born to humans or what machine did you come out of? A decent human will never write comments such as what you have written. A young woman was gang raped and murdered by the thug army. The mother, brother and a neighbor who went to look for her were also senselessly murdered by your war heroes. Disgusting and Disgraceful!!!!!!!!!!!!!!! Soon after that, all hell broke loose for your war heroes as one of them pointed to mass murders and burial sites committed by WAR HEROES, where innocent Tamils were murdered and buried. You find that amusing? I only hope you one day will suffer the same pain what these families have suffered. One day will come, people around you will laugh at you when you lose your family. Disgusting bugger. You appear to be a fellow, who has not been loved and cared for by humans. General Weeraooriya was the Jaffna commander of the Army when Chemmani massacre took place. The main man behind it was the late Major General Janaka Perera. Therefore Weerasooriya cannot claim that he does not know any thing about it. No one is directly blaming him. The whole matter was coveed up with Late Lakshman Kadirgamar telling lies abroad to defend the perpetrators ofhe crime. The then President Chandrika Kumaratunge also knew about it leave alone covering it up. If Weerasooriya is a true born again christian, he must tell the truth even at this late stage. How can Srilanka ever establish a truth and rehbilitation process, if no one is prepared to tell the truth. PROFESSING TO BE A BORN AGAIN CHRISTIAN BUT MANAGED TO GET HIS SECURITY DEPOSIT OF SEVERAL MILLIONS DEPOSITED IN THE GOLDEN KEY FROM THE BACK DOOR AND THEREAFTER APPOINTED AS A DIRECTOR OF CEYLINCO INSURANCE…… RATHER SURPRSING…… AS SEVERAL OTHER DEPOSITORS HAVE DIED AND AROUND 7 PERSONS COMMITTED SUICIDE……. BORN AGAIN CHRISTIANS DONT CREEP FROM THE BACK DOOR ?????? Another Lankan Mercenary hiding behind `sovereignty` which lies in the people and not the state. These Tamil diaspora organizations are people who are burning within themselves with hatred. They try to relieve themselves by such cheap antics. The people who lost their lives, loved ones, properties, business dignity, …. to the liberators during many riots in 1915, 1956, 1958, …1977, 1983 and in the 30 years of stupid war should thank the liberators for being compassionate. They did what they did to innocent people was solely motivated by compassion and nothing else. We need more compassion of this kind in order to relieve all people of their accumulated Karma. All of us can attain Nibbana over one night. This is a Officer & a Gentleman. How can they get the wrong man? The church is very forcefull to publicise to say how its the leader of the peace movement in times if war. The Pope – By ignoring all protocol of not visiting a country before or after an election decides to visit Sri Lankan with imminent election is siding with the meglamaniac Rajapakse. General Srilal Weerasuriya is a gentleman a true bornagain Christian. General Weerasuriya and his wife are truly dedicated Christians and their contribution to the cause of Jesus Christ in Sri lanka and around the world should be appreciated. General Weerasuriya is a Great Sri Lankan General who served his motherland with honor. All the accusations leveled against him by The South African Tamil Federation are baseless. Mr. and Mrs. Weerasuriya, continue to do your good work for the kingdom of God. Shame to Christianity. Hiding crime is same as committing it. Remember North east Sri Lanka Historically and at presence has a strong Christian background.Lot of Christians underwent lots of sufferings during the military occupations. general Srilaal is thought to be among those caused this sufferings to Jaffna Christians. There is a considerable percentage of Christians in Jaffna. AMSF must issue a statementon on their posistion on military caused suffrings of Tamil Christians and the past actions of The General SW.
@Pacs, exactly. I agree with you 100%. Unfortunately if anyone touches the Tamil issue, they are bound to lose the elections. Look either way MaRa will win the election by hook or by crook. He is a dirty scoundrel and Lankans are cursed with him for many years to come. Over the time, so many Tamils had been killed. Still, lot of Tamils are left in Sri Lanka. Why, are they rats ? Wherever you turn, whichever country you go, you will see the Tamils. Tamils, like Jews are spread all over the wide world for the simple reason, that they were harassed, deprived of their rights, education, employment in their own land. Today they speak their “mother tongue” in whichever the country they live in, they have schools for their future generations. Their hard work has been recognized, put them in the right places and even in Parliaments of other countries too. The wrongful actions against them in Sri Lanka are following the “Sinhala Wrong doers” wherever they go. The Sri Lankan Government can appoint the ex-war Generals as ambassadors or any other form but the “ghost” is following them like their shadow. The repercussions have its own effect, whether you like it or not. The Time waits for the right opportunity to grab the culprits at any cost. I know tamils fantasize equating themselves to jews. One reason for the total propaganda machinery based on lies is , the persecution they faced in SL is not sufficient to equate with the jew’s persecution. I will tell you why tamils and jews differ. 1. Jews were an ancient people who had never had a country of their own with a strong standing. They had been part of the citizenry of different other empires be it Persia or Romans. But Tamils had always had a country of their own in TN., which had remained free most of the time. 2. The reason jew spread out was they migrated due to persecution they faced at home. While tamils did not face such a situation in TN, though they faced difficulties in SL, people with better means migrated to western countries while the poor ones went to TN and others migrated within the country (other parts of SL). And Tamil migration was done by the British as labor and for administrative tasks in countries like SL, South Africa, Malaysia and S’pore. @Raja Perera, I have said this before and I will say it again. I only wish SL will see a leader like you one day. I don’t care whether the leader is a Sinhala person or a person from the minority. We need a right thinking decent human to lead this country. If you are not the one, maybe someone like you. Did you really say that to Raja perera above? @Sach, how many Raja Pereras are in this string? There is only one Raja Perera. So, think before you fire a question.